ELIBANK, a title in the peerage of Scotland, conferred in 1643, on Sir Patrick Murray, descended from the Murrays of Blackbarony in Peebles-shire, who claim an ancient descent independent of all other families of the name, [see MURRAY, surname of], and whose great ancestor is supposed to have been Johan de Morreff, in the Ragman Roll, one of those Scots barons who swore allegiance to Edward the First in 1296. William de Moray, conjectured to be his son, was one of the prisoners taken at the battle of Durham with King David the Second, 17th October 1346. John de Moravia or Murray, supposed to be this William’s son, a man of distinguished rank and figure in the reigns of Kings Robert the Second and Third, is particularly mentioned in a charter of date 14th March 1409-10, as proprietor of the lands of Halton-Murray or Blackbarony. From him descended in a direct line, Andrew Murray of Blackbarony, living in the sixteenth century, who by his second wife, Griselda, daughter of John Bethune of Creich, if Fife, relict of William Scott, younger of Branxholm, ancestor of the dukes of Buccleuch, had, with three daughters, Sir John Murray, his successor, from whom descended the Murrays of Blackbarony, baronets, of Ravelrig, Murrayshall, Cringletie, Henderland, and others of the name; Andrew, of whom there is no succession; Gideon, ancestor of the lords Elibank, and Sir William, of Clermont, in Fife, whose son, Sir William Murray of Clermont, was created a baronet of Nova Scotia 1st July 1626, ancestor of Sir James Murray Pulteney, baronet, M.P. The third son, Sir Gideon Murray, an eminent lawyer, was appointed a lord of session, when he assumed the judicial title of Lord Elibank. In his youth he applied himself to the study of theology, but had the misfortune, in a quarrel to kill a man of the name of Aitchison, for which he was imprisoned in the castle of Edinburgh. Having to into the good graces of the wife of Chancellor Arran, through her influence he procured his release and a remission. [Scott of Scotstarvet’s Staggering State, p. 49.] He now gave up all thoughts of the church, and became chamberlain to his nephew of the half-blood, Sir Walter Scott of Buccleuch. He was first designed of Glenpottie, and had a charter of the lands of Elibank, or Eliburn, in the county of Selkirk, with a salmon fishing in the Tweed, 15th March 1593-4. He is said to have carried the standard of Buccleuch, in a border conflict between the Scotts and the Johnstons, when Lord Maxwell was slain. He was knighted by the earl of Dunfermline, lord chancellor, on 4th March 1605, and on 20th February 1610, he obtained a pension of twelve hundred pounds Scots from the earl of Dunbar, which was afterwards ratified by the estates. In 1611 the king presented him with what is described as a “guilt bassing (gilt basin), whiche wes given to us by our burgh of Edinburgh, with thair propyne (gift) of money, at our first entrie of the said burgh, at our last being in our said kingdome. Togidder with two guilt cuppes, one of them in forme of a salmond, presented to us by our burgh of Glasgow; and another guilt cuppe, which was given us by the towne of Carlisle. Togedder, also, with some remanent of musk and ambergreise which was unspent at our being thair; and lastlie, ane large iron chest, which did some time belong to the late earl of Gowrie.” [Skene Papers, in Adv. Lib. No. 21.] In the parliament which met at Edinburgh, on 15th October 1612, he was member for the county of Selkirk, and was elected one of the lords of the articles for the small barons. He was also appointed a member of a commission for revising the penal statutes, and of another for settling the order of a taxation then granted to King James the Sixth, on the occasion of the marriage of his daughter, the princess Elizabeth. When the king’s favourite, Robert Kerr, (in England altered into Carr) afterwards earl of Somerset, was appointed lord high treasurer in 1613, he constituted Sir Gideon Murray his deputy, in which situation he was subsequently continued by the earl of Mar, when appointed to the same office. On the 2d November, the same year, he was admitted one of the lords of session. In 1616 his pension was augmented to two thousand four hundred pounds Scots, and extended to his sons. The entire management of the revenue of Scotland was in his lordship’s hands, and it is acknowledged to have been so judicious that he was not only enabled to repair the palaces and royal residences of Holyroodhouse, Edinburgh castle, Linlithgow, Stirling castle Dunfermline, Falkland, and Dumbarton castle, with the addition of new edifices to them all, but he had so much money in the treasury as to defray the expenses of James and his court on his visit to Scotland in 1617. The king had a very high sense of his services, and on one occasion, Sir Gideon happening, in the king’s bedroom, to drop his chevron, his majesty, though both old and stiff, stooped down and gave him his glove; saying, “My predecessor, Queen Elizabeth, thought she did a favour to any man who was speaking with her, when she let her glove fall, that he might take it up, and give it to her; but, Sir, you may say a king lifted your glove.” Yet for all this, James, in 1621, was induced, on an accusation made by James Stewart, Lord Ochiltree, of malversations in his office of treasurer depute, to order him to be sent a prisoner to Scotland, and a day was appointed for his trial. He was so much affected by this treatment that he took to bed, and abstained from food, believing, says Scotstarvet, [Staggering State, page 51,] that he had no money either to get meat of drink to himself, and, after an illness of twenty days, during the greater part of which he remained stupified and silent, he died on 28th June 1621. By Margaret Pentland, his wife, he had two sons and a daughter, Agnes, married to Sir William Scott of Harden, who was the eldest son of “The Flower of Yarrow.” The second son was, in 1610, committed to the castle of Edinburgh for accepting of a challenge from the son of Lord Cranstoun, while the latter was sent to the castle of Blackness for sending it. Both youths being called before the privy council, a reconciliation took place, but Lord Cranstoun’s son, for attempting to renew the quarrel, was banished the king’s dominions till he could make his peace with his majesty. A curious letter on the subject, from the privy council to King James at London, under date 10th August, 1610, is inserted in Pitcairn’s Criminal Trials, vol. iii. p. 505, quoted from the Denmylne MSS. in the Advocate’s Library. Sir Patrick Murray, the elder son, was appointed, in his father’s lifetime, by a letter under the great seal, dated 27th June 1611, governor or keeper of the king’s castle of Caerlaverock, with an annuity of fifty pounds sterling for life. He got several charters of land between 1613 and 1630, and was possessed of a large estate. On 16th May 1628 he was created a baronet of Nova Scotia, and in the parliament of June 1633 he was elected one of the lords of the articles for the barons. He was raised to the peerage by the title of Lord Elibank, by patent dated at Oxford, 18th March 1643, to him and his heirs male whatsoever. He adhered firmly to Charles the First during all the time of the civil war, and lent the king a large sum of money when at Oxford, his majesty’s bond for which the family are said still to retain. He was one of the six peers who, in January 1647, opposed the delivering up of Charles to the parliament of England. He died 12th November 1649. His lordship was four times married, and had several children. One of his sons settled in Ireland, and was ancestor of the Murrays of Ravigny there. His eldest son, by his second wife, (Elizabeth, daughter of Sir James Dundas of Arniston) Patrick, second Lord Elibank, joined the marquis of Montrose when he appeared in arms for Charles the First in 1644, and was fined twenty thousand merks by the committee of parliament in 1646. He died 13th February 1661. By his wife, Lady Elizabeth Stewart, second daughter of the second earl of Traquair, lord high treasurer of Scotland, he had, with one daughter, two sons, Patrick, third lord, and the Hon. John Murray, a captain in the army, killed at the battle of Antrim, in Ireland. Patrick, third lord, was a privy councillor to King James the Seventh, but in 1687 was laid aside for opposing the repeal of the penal laws, and died the same year. By his wife, Anne, daughter of Alexander Burnet, archbishop first of Glasgow, and afterwards of St. Andrews, and widow of the seventh Lord Elphinston, he had, with four daughters, one son, Alexander. Alexander, fourth lord, was born 99th March 1677. He was a minor at the time of his father’s death, and on coming of age he took the oaths and his seat in the Scots parliament 19th July 1698. He supported the treaty of Union, and died in February 1736, in his fifty-ninth year. He married Elizabeth, daughter of Mr. George Stirling, surgeon in Edinburgh, and M.P. for that city, and by her he had, with several daughters, five sons. The Hon. Alexander Murray, the fourth son, was an ensign in the 26th foot or Cameronians, his commission being dated 11th August 1737. He was so enthusiastic a Jacobite as to propose heading an insurrection in favour of the Pretender, and at the Westminster election of 1750, which was keenly contested, he was extremely active on the part of Sir George Vandeput, the candidate opposed to government. A complaint was preferred against him to the House of Commons by Peter Legh, high bailiff of Westminster, that Mr. Murray had encouraged a mob to proceed to acts of violence against him, saying, with imprecations, “Will nobody knock the dog down? Will nobody kill the dog?” On this complaint he was ordered, on 6th February 1751, to be committed close prisoner to Newgate, and as he refused to express contrition on his knees, he was detained in confinement till the succeeding June, when he was released by a prorogation of parliament. Accompanied by Lord Carpenter, and Sir George Vandeput in his coach, and the sheriffs of London in a chariot, Mr. Murray went in procession, preceded by a great concourse of people, from Newgate to the house of his brother Lord Elibank, in Henrietta Street, near Oxford Market, London, a flag being carried before hi, inscribed, “Murray and Liberty.” A mezzotinto print of him was engraved, and a pamphlet published, entitled ‘The Case of Alexander Murray Esq., in an appeal to the people of Great Britain, more particularly to the inhabitants of Westminster.’ As this pamphlet contained some severe reflections against a noble duke, the House of Commons, and the high bailiff of Westminster, a general search was made for it, and on the 2d July, the printer, Owen the publisher, and several booksellers were examined at the secretary of state’s office, when the two former were ordered into custody and the rest discharged. Not choosing to place himself again in the power of the House of Commons, he went, in November of the same year, to reside in France, where he was styled Count Murray. At the meeting of parliament, 25th November, a motion was carried in the House of Commons for his being recommitted to Newgate, and a proclamation was issued offering a reward of five hundred pounds for taking him into custody. He was at Paris in 1763, when he made a conspicuous figure in the quarrel betwixt his friend Captain Forbes and the noted John Wilkes. He also proved extremely active in behalf of the pursuer in the great ‘Douglas cause’ against the duke of Hamilton. He remained in exile till April 1771, when he was recalled to England, by a letter from the privy council, and died, unmarried, in 1777. The Hon. Barbara Murray, eldest daughter of the fourth lord, married Sir James Johnstone of Westerhall, Dumfries-shire, and had fourteen children (see JOHNSTONE,) whose third son, Sir William Johnstone Pulteney, father of Henrietta Laura Pulteney, created in 1803 countess of Bath, died one of the richest subjects of Great Britain, 31st May 1805, aged eighty-five. The eldest son, Patrick, fifth lord, a learned and accomplished nobleman, was born in February 1703, and admitted advocate June 22, 1723, but not with any view of practising at the bar. The same year he entered the army, and in 1740, five years after he had succeeded to the title, with the rank of lieutenant-colonel he accompanied the expedition under Lord Cathcart to Carthagena, of which he wrote an account, still, we believe, remaining in manuscript in the library of the Board of Trade. After residing for some years in Cambridgeshire, his lordship returned to Edinburgh where he spent the latter period of his life. By the literati of that city he was much esteemed for the acuteness of his understanding, the agreeableness of his manners, and the extent and variety of his information. When Dr. Johnson visited Edinburgh in 1773, Lord Elibank addressed a letter to him, and he had afterwards various conversations with the learned lexicographer, all of which are duly recorded by Boswell in his “Tour to the Hebrides.” In politics his lordship belonged to the party in opposition to the government, and he is now known to have maintained a secret correspondence with the exiled house of Stuart. He married in early life the Dowager Lady North and Grey, daughter of Cornelius de Young, lord of Elmeet, in Holland; and died, without legitimate issue, August 3, 1778, in the seventy-sixth year of his age. Thoughts on Money Circulation, and Paper Currency. Edin. 1758. Inquiry into the Origin and Consequences of the Public Debts. Edin. 1759. Queries, relating to the proposed Plan for altering Entails in Scotland. Edin. 1765. A Letter to Lord Hailes, on his Remarks on the History of Scotland. Edin. 1773. Considerations on the present state of the Peerage in Scotland. Edin. 1774. This work related to the mode of electing the representative Scots peers, and attracted considerable notice at the time of its publication. 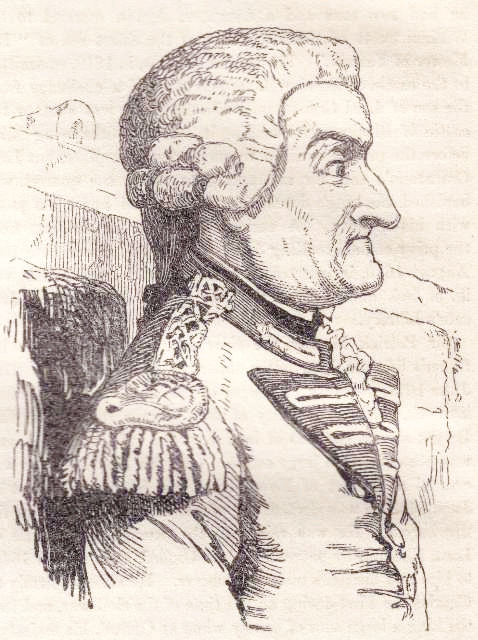 George, sixth lord, born in 1706, an officer in the navy, was commander of the Trial sloop of war, one of the squadron under Commodore Anson, which in 1740 made the circumnavigation of the globe. At Madiera he was promoted to the Wager frigate with the rank of captain, 3d November, 1740, and in the following February he removed to the Pearl of 40 guns, but separating from the squadron in a gale of wind, off Cape Noir, he put back to the Brazils and returned to England. After having had the command of the Hampshire of 50 guns and the Revenge of 70. He was, in 1756, placed on the list of superannuated rear-admirals. In 1778 he succeeded his brother in the title and estates of Elibank, and died 12th November 1785. By his wife, Lady Isabel Mackenzie, eldest daughter of th attainted earl of Cromartie, he had two daughters; Maria, married to Edward Hay, Esq, of Newhall, brother of George, eighth marquis of Tweeddale; and Isabella, unmarried. On inheriting the Cromartie estates through their mother, they assumed the additional name of Mackenzie, as did also the husband of the elder daughter, Mr. Edward Hay. The sixth lord dying without male issue, the title devolved upon his nephew, Alexander, elder son of the Hon. Gideon Murray, D.D., prebendary of Durham, third son of the fourth lord. Alexander, seventh lord, born 24th April 1747, an officer in the 3d regiment of foot-guards, previous to his succeeding his uncle, was M.P. for the county of Peebles. He was lord-lieutenant of that county and colonel of its local militia. He died 24th September 1820. He was twice married: first to his cousin-german, Mary-Clara-Montolieu, daughter of Baron de St. Hypolite, by whom he had three sons and two daughters; and, secondly, to Catherine, daughter of JAMES Stewart, Esq., by whom he had three sons and four daughters. The Hon. George Murray, his third son by his first wife, was auditor of the exchequer in Scotland. James, his eldest son by his second marriage, an advocate at the Scottish bar, was killed at Borneo, 17th December 1844, aged thirty-four. The eldest son, Alexander, eighth lord, born 26th February 1780, married 8th March 1803, Janet, daughter and heiress of John Oliphant of Bachilton, Perthshire, styled Lord Oliphant, by whom he had sic sons and eight daughters. He died 9th April 1830. His second son, The Hon. John Oliphant Murray, born 3d July 1808, is chamberlain to the king of Bavaria, and knight Grand Cross of the order of St. Michael of Merit. The eldest son, Alexander-Oliphant, ninth lord, born 23d May 1804, married August 6th 1838, Emily Maria, only daughter of Archibald Montgomery, Esq., and niece of Sir James Montgomery of Stanhope, baronet, and has two sons and two daughters. The elder son, the Hon. Montolieu Fox Murray, master of Elibank, was born in Edinburgh in 1840.